The poor soils and harsh climate of the mountains make for wines of distict character; these wines have been said to sometimes give the impression of sucking stones. 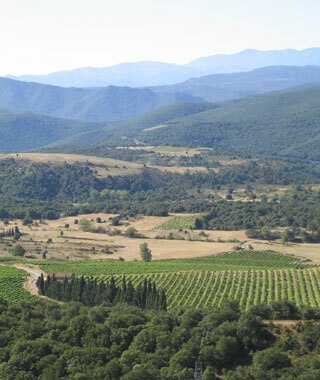 The Fenouillèdes is an ancient route to Spain, situated between Catalonia and the Languedoc. Historically, this region has always been attached to the Languedoc (a Narbonnaise province at the time of the Romans and a Septimanie province at the time of the Visigoths…). Thus, it has always been a frontier zone, acting like a border between two regions. The traditional language is Occitan (langue d’Oc) and the locals fiercely protect their identity and dialect. The region reaches 1300 metres altitude. As you approach the plain the climate is Mediterranean and as you ascends the Pyrenees it becomes cooler, typical of a mountainous terrain. The name ‘Fenouillèdes’ comes from the latin – ‘Pagus Fenolietensis’, meaning the country of hay. Viticulture has been established in the region for a long time, but it was confined to the warmest terroirs and the steepest slopes. The slopes were south facing, in French known as adret and in Occitan, Soula or Soulane. One of the lieu-dit, where we have our oldest vines, is called Lo Soula.